Portable pen cases in this form are not uncommon, but this example is more finely cast and decorated than most. The hinged scallop shell cover over the ink pot is particularly nicely cast. One side of the case is etched in flowing Arabic script. The other side is etched in a typically Islamic repeated scrolling motif. The cover of the case is secured to the case by means of a heavy hinge that in turn is secured by copper rivets. 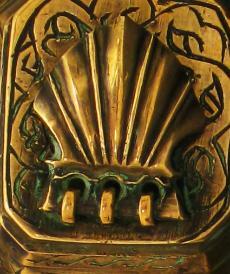 The use of scallop shell motifs in such cases is typical; scallops in both the Christan and Muslim worlds denoted pilgrims and travellers, given their association of scallops with the sea. Cases such as these were used to hold goose and reed quills for writing. The long barrel of such cases could be slipped under the belt and worn during travel.